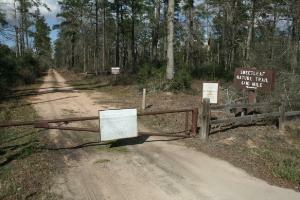 This is the entrance to the trail as seen from the shoulder of FM1488. Sweetleaf Nature Trail sits right off FM1488. You have to be on the lookout for it because there's only a small sign indicating where it is. You might miss it while speeding down FM1488 at 60mph. On the day I went, the gate to the dirt road entrance was closed. Fortunately, right across the street is the WG Jones State Forest recreation area which has a small dirt parking lot. After braving the crossing of FM1488 on foot, I stepped over the gate and walked about 1/4 mile before getting to the nature trailhead. The trail basically parallels a small meandering stream. The trail is well-marked and has many wood bridges along the way to help improve footing. At the far-end of the loop, there is a small suspension bridge which is kind of fun since it flexes and swings when you walk across it. Kids will love it. I did see a deer, but there's not much solitude because of the noise of traffic roaring down FM1488 nearby. It is a cool, little escape, however, if you want a getaway.